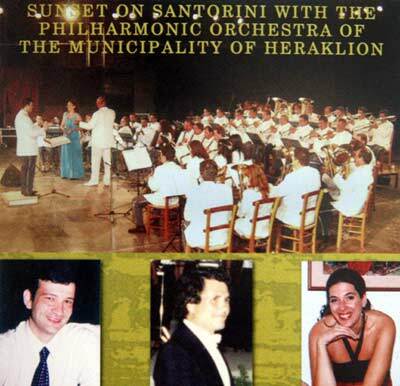 Arkadi - the Cretans association of Santorini organises a concert of Heraklion Philharmonic Orchestra at Oia during the sunset. The orchestra will be under the command of Leonidas Tzortzakis with Georgios Psaroudakis and Lena Xatzigeorgiou. Another concert will take place at Santo Wines in Pyrgos the next day July 29, 2007. 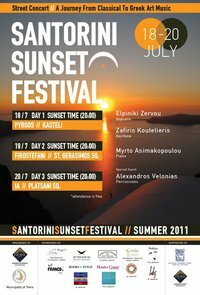 With great joy the Municipality of Thira and Kisiris Events welcomes you to a series of cultural events entitled SANTORINI SUNSET FESTIVAL. This is an idea that aims to bring visitors into contact with the art against the magnificent sunset. The aim is to combine the glory of nature framed with art events that highlight the beauty of our island. For the July 2011 plan to introduce a series of concerts with major axis passing from the Classical Greek art music. A trip from the arias of Mozart and Puccini favorite tunes Costa Giannidi, Manos Hadjidakis and Mikis Theodorakis. The start time is 8.00pm and attendance free. We would advance to thank the municipality Hunting for his valuable contribution to the preparation of events. In particular Mr. President Aris Floridis who listened and took the original idea and helps us put into practice. Precious is also the help from several companies of the island, without their contribution this idea would not be feasible. We hope SANTORINI SUNSET FESTIVAL become an institution that brings art in relation to our natural landscape and promotes our culture, addressed the citizens and visitors. We wish and hope to respond to the call, paying with your presence the spark and impetus for further cultural events of high quality. 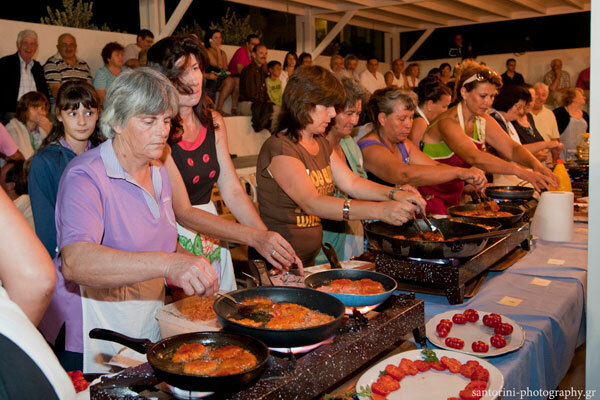 - Round table discussion on "Gastronomy and Tourism in times of crisis"